Max XVII's Story . . .
Update 09/30/2014: “Max is a sweetheart....He just loves being loved." Max is a sweetheart. He is doing so well at his foster home and has lost a lot of weight with his thyroid meds and much exercise. He now runs and prances when he goes outside. He’ll always be a big boned boy, but he has lost weight on his hips and his hind legs must feel so much better not carrying that fat. Being thinner makes Max happier. His mile long walks are easier on his body, and he no longer lags behind and needs encouragement to keep walking. Max is good in the house and does not need to be crated. He just loves being loved. He is a Velcro boy and can even be found sitting with his person in the bathroom. He has a way of lying down with his front legs crossed in front of him. Although he gets along well with other dogs, this gentle giant is nervous around new things. A dog barking or running at him makes him run to his mom’s side. This handsome fellow thinks he is a guard dog. He barks when he hears someone come to the house. But, while his size and bark are a deterrent, he is a gentle soul and not a threat to visitors. He is fine off lead, walking outside to do his business and coming back in. This smart fellow doesn’t leave his yard. Max would be a great working person’s dog. He requires little maintenance and offers so much love. Does your home have room for this almost senior? What fun you could have with him!! Max settled into a new foster home recently and continues to do splendidly. He’s getting lots of exercise and has been losing inches. A big-boned boy, Max is at an estimated 70 pounds now, down from 80, and is looking good. 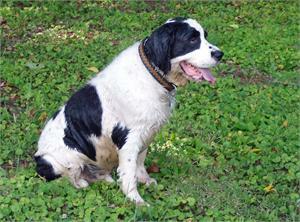 His adopting family will want to give Max regular exercise to keep his body and joints supple. He’s getting mile-long walks now. Max’s foster mom says he is happy sleeping the day away and isn’t always excited about going out but he is happy to return. He’s definitely healthier for the outings. Max loves water and puts his whole head under to cool off on these hot summer days. Having the chance to swim for part of his exercise might be perfect option for him. “Docile”, “big teddy bear”, “so sweet”.............all these superlatives come to mind when talking about Max. He simply has not bad habits. He comes when called and stays around the house when he’s off lead outdoors. He walks nicely on a leash and just continues by another dog when he’s out with his foster mom. Like most Springers, he loves car rides. He doesn’t get on furniture or beds but enjoys snoozing bedside or under this foster parents’ bed at night. Most of the time Max is a quiet dog. He does bark when he’s sitting by you and someone comes into the room. It’s as if he’s announcing the newcomer’s presence and is not showing aggression. You just speak his name and he’s his quiet self again. This gentle giant has a big heart to match his handsome and sizable frame. Max may take up a little more space at home and in the car than more diminutive Springers but the upside is that there’s more of him to hug. You couldn’t find a companion who’s easier to live with than Max......... mellow, personable, undemanding and loyal. Life is good for Max these days and life can be good with Max. Ask about meeting him if you’re watching for a ready-made companion!! Update 07/24/14: "Max is one choice dog.........well mannered, adaptable and with an easy, relaxing nature." Max was adopted through MAESSR several years ago and was his owner's "best buddy." Unfortunately, the owner died last year and his wife is now moving in with her daughter. If stressed, Max will sometimes guard an item, so his family felt it best that he return to foster care. He’ll have the opportunity to work on this issue as well as some weight loss and to ready himself for another home while in the hands of Springer-savvy folks. A lucky dog, Max walked back into the same foster home he had been in before and acted like he had never left. This sweet teddy bear of a boy just makes his foster mom smile. With his return, Max visited the vet. When weighing in, it would seem that he has been the fortunate recipient of table scraps which added some extra pounds. Other than that, he is in good health. He is a low energy guy and acts older than his 8 years, due in part to some apparent joint pain. Increasing his activity level and decreasing his weight will surely help. He continues on medication for low thyroid and, with fewer “goodies” in his foster home, it’s expected that this big boy will trim down nicely. Max’s house manners remain stellar. He is housetrained and will bark when you walk in the door, to say “Welcome home!” He doesn't dig, submissively urinate, counter-surf, or jump on people. He's never had formal obedience training but knows "sit” and “paw." Because of his trustworthy nature, Max has never been crated and has full freedom throughout the house. He does “come” when called and rides well in the car. A family member had been grooming Max and reported that he is "easy to groom." He doesn't mind his feet and ears being handled. He is afraid of thunderstorms and will run into the bedroom to wait them out on the bed, not under the bed but on the bed..........:)). Max’s foster family finds that he is very mellow and sweet. He has met small children this time around in foster care and is very tolerant of them. A neighbor child, who is younger than two, accidentally poked him in the eye when she was patting him and he didn't even flinch...............good boy!! He walks well on a leash and ignores the kitties he sees along the way. Back at home, he likes to just hang out on the front porch or follow his foster mom around the yard without a leash. He has no inclination to go wandering. Update 01/04/11: "Whether in the bed or bedside, this sweetie is going to make someone a wonderful foot warmer........and he will gladly inventory your flip flop collection in his spare time........:))." Max recently returned to MAESSR. He was stealing too many items in his adoptive home and did not want to return them. When Max arrived in his foster home, his foster mom immediately decided that his thyroid levels needed to be checked. When the results came in, the levels were low. Low thyroid levels can cause a dog to be more "grumpy" and unreasonable than they really want to be. Max was started on thyroid meds and his outlook and energy level have dramatically improved. Max is a great Springer boy that loves children and being with his people. He will play with toys and loves to steal flip flops. He does not chew up the flip flops........just steals them! Max rides very well in the car and does pull on his leash when being walked. A little remedial training on his leash manners would be one easy way for him and his new family to begin bonding. This rascal also likes to sleep in the bed with his foster family and, though not by any means a requirement in his new home, from Max's point of view, carrying this little habit over would give him another perfect chance to bond with his new people! Whether in the bed or bedside, this sweetie is going to make someone a wonderful foot warmer........and he will gladly inventory your flip flop collection in his spare time........:)). Update 10/19/09: "On the few occasions when he slipped out the front door, Max has never tried to run off at all and will come right back in." The latest news on this handsome boy as he eagerly awaits an adopting family.........Max is very loving and wants someone that will pay a lot of attention to him. He is still a puppy at 3 years old and wants to play. His foster family has not let him run off leash because they live on the water and a busy road. On the few occasions when he slipped out the front door, Max has never tried to run off at all and will come right back in. Max will make a wonderful family pet as he is very sweet and does not have a mean bone in his body. He is definitely not an alpha dog. He is definitely a Velcro dog with his foster mom and the resident dog lets Max get away with it which is surprising. This softie will do well with or without canine companionship in his adopting home. The most important thing he is looking for are humans who are as loving as he is! Update 09/08/09: "He will roll over for a belly rub in complete submission." Max has made great strides since coming into his foster home. Since his neutering, his marking behavior has almost completely disappeared. 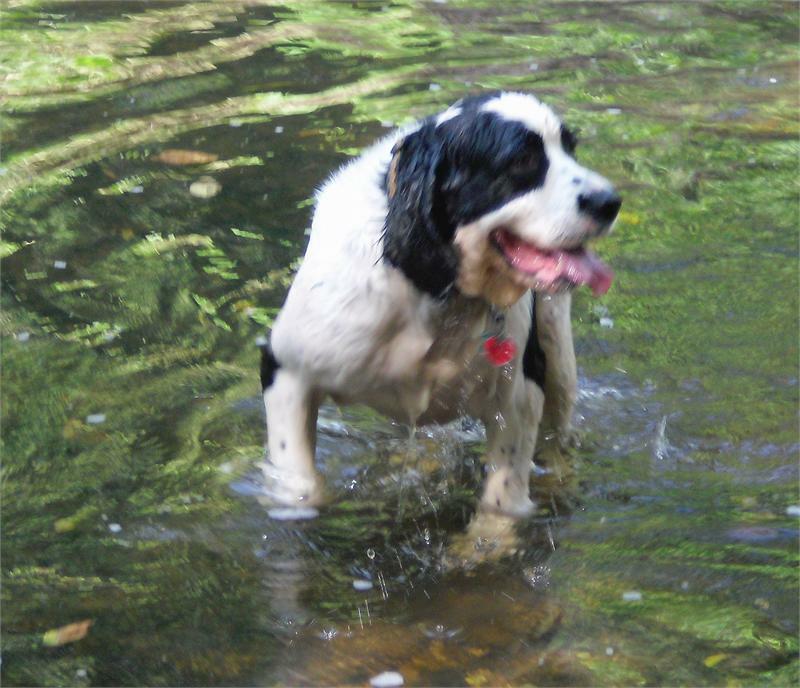 Though naturally a big Springer, Max has lost 2 pounds, possibly even a bit more by the time of his next vet check. He enjoys free run of the house and has been good, except for a stolen slipper or two which he did not chew up. Max's foster mom and another volunteer are working with him on his manners when people arrive. He not only barks at men but seems to be barking at everyone at the door in excitement. With training began in this area, his adopting family will likely need to continue it as Max adapts into a new home. Every day Max is more comfortable in his foster home. He has learned to play with toys. Recently when his foster mom threw a toy, Max retrieved it several times. What a thrill! He is also playing with the resident dogs now. If they play too rough, his foster mom can break it up. The resident male has grown to like Max and now they sleep together in their foster mom's room. Right along with becoming more comfortable, Max is more loving. He will roll over for a belly rub in complete submission. His foster mom feels a family with older children would be great for Max because he really wants to play and have a lot of attention paid to him. He is a really sweet boy with lots of love to give. He'll be ready soon and will bring a lively spirit to some lucky family! Note: To correct a point regarding his past, Max was bred by an Amish family and not relinquished by one. Original: "Kindness, calmness, and lots of petting are the methods of choice to convince Max that men can be just as loving as women." When the 12 year old daughter in his family was found to be allergic to him, Max was kept outside on the deck all morning and then went in the basement with another dog that was also penned off there. Realizing that Max deserved more in life, his Pennsylvania family contacted MAESSR to find him a loving new home. Although Max weighs in at 66 pounds, he is not overweight; he is just a big Springer. He has a beautiful, sweet face and will make a nice family dog with older children. With younger ones, he could possibly knock them over, accidentally. When he arrived in his foster home, he had been shaved probably due to the allergy of the child in his relinquishing home, but he has curly ears and evidence of curly Springer feathering around his legs. Although housetrained, Max had done some marking in the house prior to his neutering. Needing to be kept quiet after his surgery, Max could not be crated due to the big E-collar he has to wear, so he has the computer room all to himself and is kept on a leash when he is outside of the room. 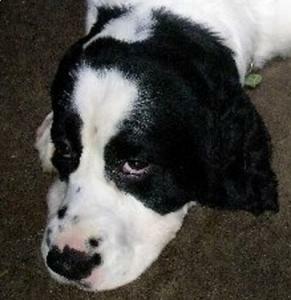 At night, Max and his foster mom are bunking in the guest bedroom while the two resident Springers and foster dad are in the master bedroom. How is that for MAESSR foster parent dedication?! Max's foster dad is helping Max to overcome a barking problem and apprehensiveness around men; Max barks at people......especially men....... when they approach him. Kindness, calmness, and lots of petting are the methods of choice to convince Max that men can be just as loving as women. Max is very sweet and loving to his foster mom and hopefully will grow to feel the same way about his foster dad and other men. Max does not play with the resident dogs yet, but he does want to play with his foster mom. He does not know anything about the toys that have been offered to him, though. In his foster home, the resident male Springer tends to pester other male dogs, so until Max heals further from his neutering, the boys will be separated. 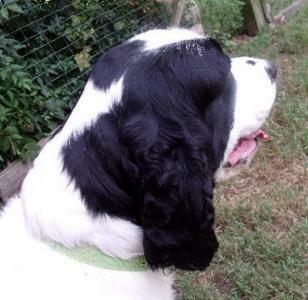 Currently, Max is afraid of this older male, but he gets along fine with the resident female Springer. Beyond knowing his name and responding to "come", Max does not seem to have had much training although he does walk well on the leash. When it comes to car rides, Max has not had much practice since his relinquishing family was Amish. A quick learner, Max is a fine passenger after he is helped into the back of his foster family's station wagon. Max enjoys going into the fenced yard with his foster mom and would love to run around. Be patient, Max! Soon your E-collar can come off and you will be able to burn off some of your energy and socialize more with the other dogs. Watch for more about Max and he grows more comfortable in his foster home.